The finger guard at first seemed a little flimsy. 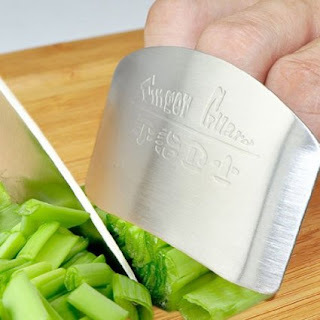 But here we will be sliding the knife down the surface of the finger guard and not chopping with a cleaver or stabbing at our fruit, vegetable or meats as we prepare them. My fingers are also on the large size and the metal is maliable enough to accommodate my fingers in the guard for the time it takes me to chop my ingredients.. If I needed to use this guard for several hours on end in a professional kitchen it would not be comfortable but for the five or ten minutes it may take me to prepare a meal then this finger guard is good enough. Holding most items like onions and vegetables is easy, I have found the finger guard doesn't really interfere with my ability to control the items which I am chopping. In fact I am now able to cut softer items such as tomatoes more easily as I hold the tomato much closer to where the knife blade is cutting preventing the squashing effect of the blade. The Buy In House Finger Guard is easy to clean as there are no hidden places where food particles can clog into and it is also easy to keep clean while you work. You can quickly chop an onion was the finger guard and then chop an egg without having the onion flavor transfer to your egg. This finger guard is less expensive than most similar products which are often made from a heavier gauge of steel or even chain mail gloves which also protect the whole hand. To read reviews of the Buy In House Finger Guard click here. The Buy In House Finger Guard could also make a great gift for anyone who is not happy using a knife to chop vegetables in the kitchen or would be great for children who are learning to cook.